Have you SEEN the insane Black Tap milkshakes on the interwebs recently? I keep seeing other food bloggers posting pictures of them on instagram, like this Cookie Shake, and this Birthday Cake Milkshake (IT HAS A PIECE OF CAKE ON IT *SCREAMS INTERNALLY*), and s’mores and red velvet! Y’all know how I feel about all these flavors. 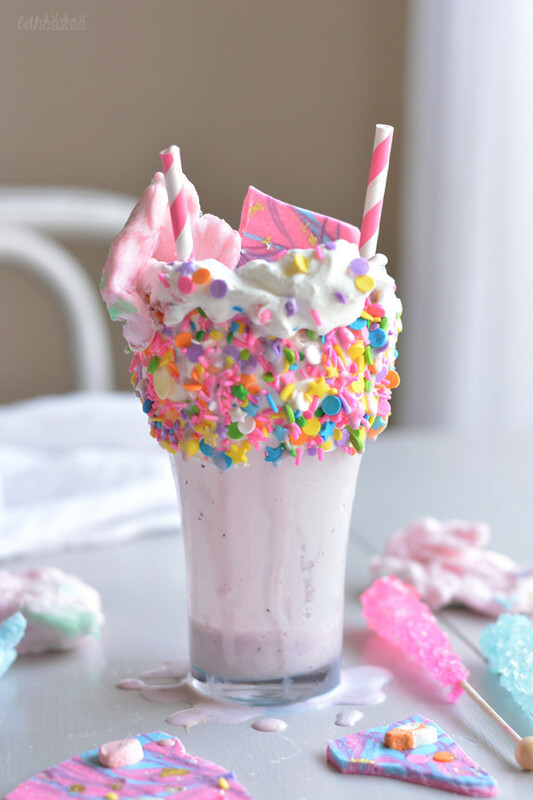 Since I sadly have no plans funds for going to NYC any time soon, I decided that I should just probably make one of these milkshakes myself. 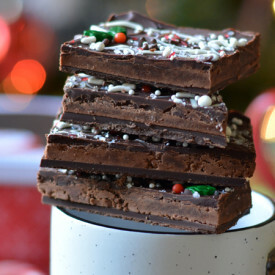 Another fad making its rounds through the internet is unicorn bark. It’s so colorful and happy and is just a little bit “too much” you know? So I thought it’d be perfect as the inspiration for a Black Tap milkshake! 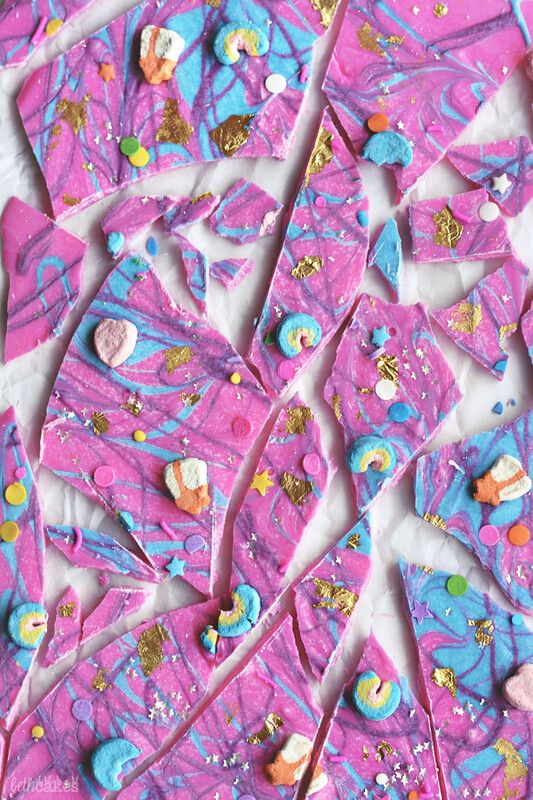 Basically, unicorn bark is different colored candy melts and various, sparkly sprinkles and decorations. Here we’ve got pink, blue, and purple candy melts with pink as the base. While it’s still wet, go to town with the decorations and sprinkle that stuff on there to your heart’s content! 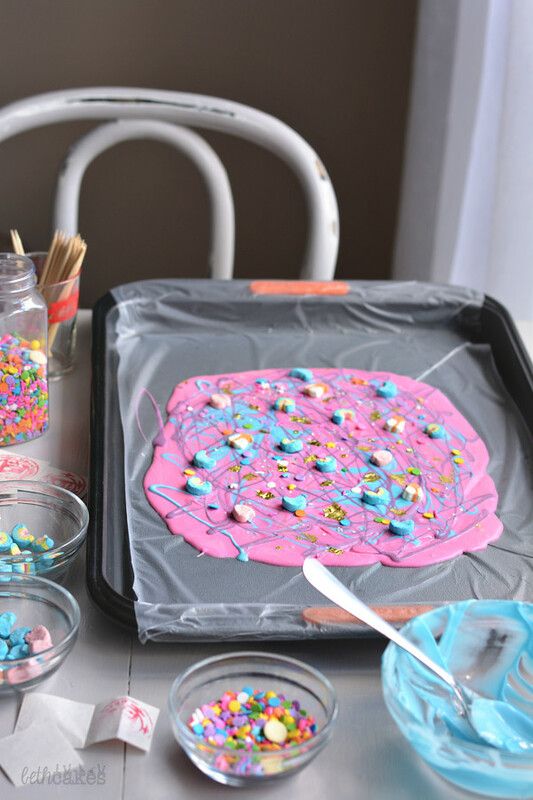 There is no right or wrong way to do unicorn bark as long as you include plenty of embellishments. I used sprinkles (my favorite from Sweetapolita), tiny silver stars, and obviously I had to use the rainbows from a box of Lucky Charms. I decided the hearts, crescent moons, and shooting stars were cute as well and could probably be consider unicorn-appropriate. Also edible gold foil is my new favorite thing, so I slapped some of that on there too. To be perfectly real with you, this milkshake is 85% about the decorations. 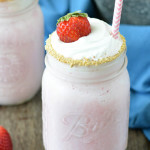 For the actual shake part, I used vanilla bean ice cream and some fresh strawberries and raspberries because it had to be pink. 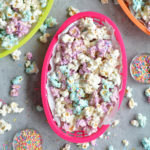 The rest of the decor includes cotton candy, rock candy, whipped cream, and more sprinkles. I attempted to drizzle blue ganache all over the top, but the lid came off of the the squeeze bottle I was using while assembling this thing in my freezer. It made such a huge mess (IN the freezer) that I’m still not ready to talk about it. Line a baking sheet with plastic wrap or wax paper. Melt pink candy melts in a microwave-safe bowl according to package directions. Do the same with blue and purple. Pour blue and purple candy melts into squeeze bottles or ziploc/piping bags with a small tip cut off. 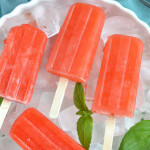 Pour melted pink candy onto the baking sheet and spread into a rectangle, about ¼-inch thick. 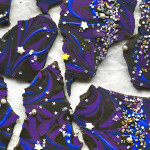 Drizzle with blue and purple candy. Tap baking sheet against the counter or table to help the candy flatten out. Place baking sheet in the fridge for about 30 minutes to and hour for bark to set. Once bark is hard, use a knife to cut it into pieces, or use your hands to break it up. Place about 4-5 large scoops of ice cream in a blender. Add about ½ cup diced strawberries and ¼ cup raspberries. Add ½ cup milk. Blend until smooth. Add more ice cream or milk depending on your preferred consistency. Pour shake into the glass. 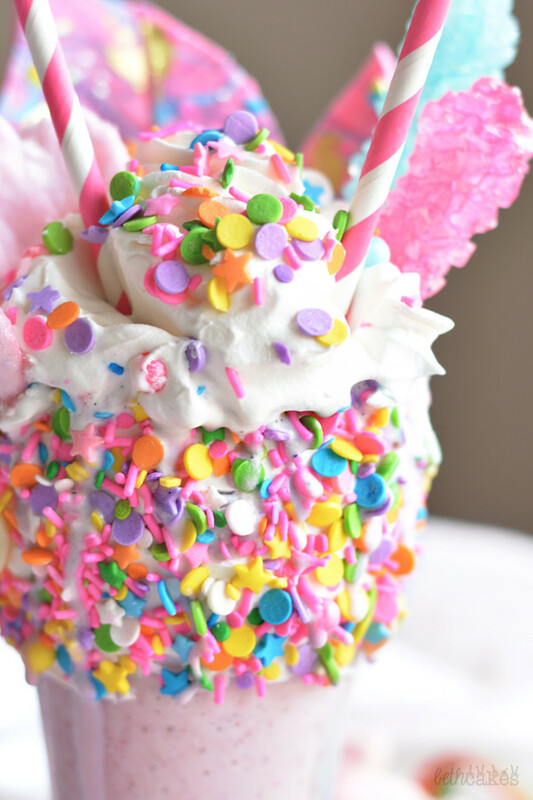 Top with whipped cream, stick on some pieces of unicorn bark, cotton candy, rock candy, and sprinkles! Beth! 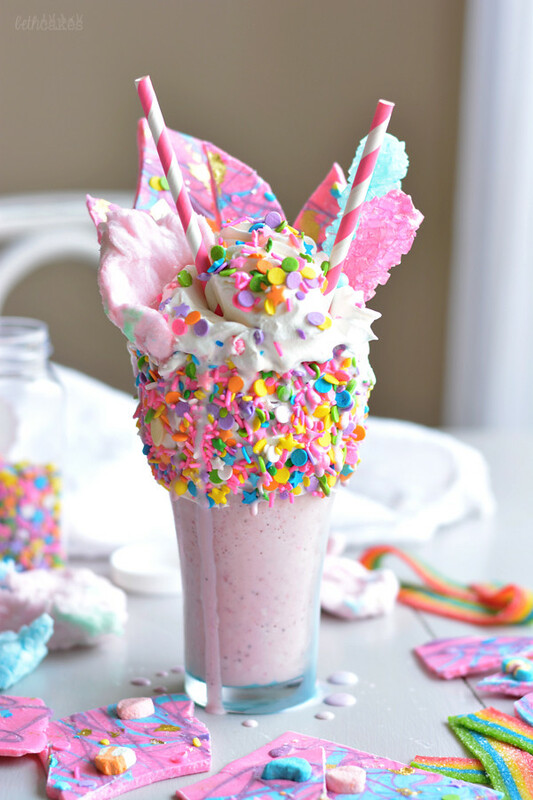 This milkshake is colourful, creative and so darn outrageous! If this was on the menu, I would TOTALLY order it. You’ve outdone yourself girl! Pinned! Over the top on this one! Your photos make me want to lick my screen! It’s just too cha-cha for words! I want it. haha apparently I live under a rock because I’ve never seem unicorn bark before!! Thank you for the introduction! This is just so colorful and fun! Happy weekend!! I enjoyed reading this and the pics are great. Oh and I’m sure this milkshake tasted awesome. 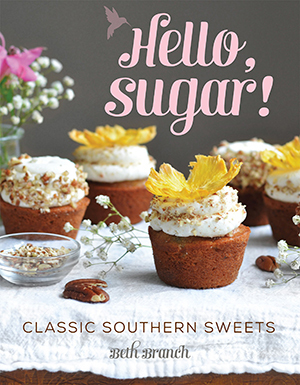 Sugar high in the best way!!! 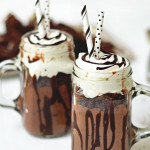 What a fun milkshake! So colorful and creative! Oh my goodness! 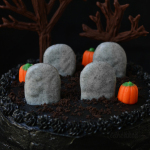 This is so decadent! Aaaah I love this so much! I am 200% obsessed with Black Tap Milkshakes and I stalk them on IG. 🙂 Your version is so cute and fun for spring! 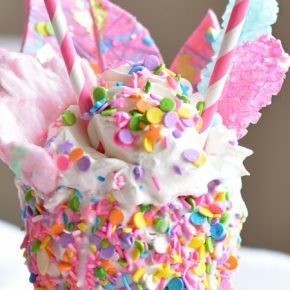 Pingback: 12 easy unicorn party treats that don't require magical kitchen skills.